Since there is no evidence that the size of planet Earth has transformed significantly,because the old crust must be recyced by the earth at the same pace that the new crust is formed at divergent boundaries. The recycling of the old crust occurs at bondaries where the earths plates meet. These boundaries are called convergent boundaries. The collisions that occur when plates come together are very slow and they can last for millions of years. When plates come together, one plate sinks below. 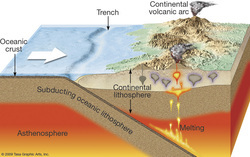 Normally if its oceanic-continental convergence the oceanic plate will sink into the Earth's mantle and if ti's continental convergence when the collision of the two plate occur that force up mountains of area to high level ground and if it's oceanic-oceanic convergence the older and colder plate will sink into the mantle. The places where this happens are called subduction zone. You can think of subduction as the natures recycling port.